This photograph, taken Feb. 21, 2010 by Japanese astronaut Soichi Noguchi, shows the space shuttle Endeavour performing an S-turn to slow its speed during landing, as seen from 220 miles up from the station's new Cupola lookout. When NASA?s space shuttle Endeavour landed safely onEarth Sunday night, reporters weren?t the only ones pointing cameras at thereturning spaceship. An astronaut took his own snapshot of the shuttle landingfrom space. Astronaut shutterbug Soichi Noguchi of Japan caught arare view of the shuttle landing from space as the orbiter streaked throughEarth?s atmosphere. His photo perch of choice: More than 200 miles (321 km) upand inside International Space Station?s brand-new Cupola, alookout dome covered in seven windows ? including a huge round one that is thelargest space window ever built. The image shows Endeavour as it is performing a so-calledS-turn, one of several turns used to slow a landing space shuttle from Mach 25,the rate they fly when they enter Earth?s atmosphere. 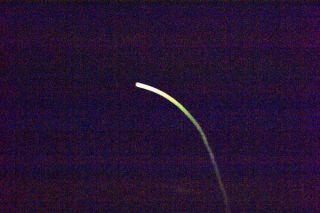 While the zoomed-in image appears grainy, the curve caneasily be seen because of the plasma trail left behind by Endeavour as itsailed through Earth?s atmosphere. Astronauts have seen spacecraft re-enterEarth?s atmosphere in the past, but Noguchi is the first to photograph theevent from the station?s new lookout. ?SpaceShuttle Endeavour making S-turn during atmospheric re-entry,? Noguchi wroteon his Twitter page, where he posts mission updates and space photos as @Astro_Soichi. ?The first time it was photographed from Space Station Cupola. Priceless.? Noguchi and the space station were flying about 220 miles(354 km) above Earth at the time he took the photograph. The station typicallyflies about 17,500 mph (28,163 kph) to stay in orbit, so astronauts have saidthey have to plan well ahead if they want to catch a clear photo of a specific targeton Earth. The station is equipped with several high resolutioncameras, including NASA-issue cameras that come with 400 mm and 800 mm lensesfor shuttle heat shield surveys. The space station?s Cupola is about 10 feet (3 meters)wide and 5 feet (1.5 meters) deep and offers panoramicviews of Earth and space to astronauts. It points down toward Earth fromthe space station?s new Tranquility module, a bus-sized room delivered byEndeavour?s crew before they left the space station on Friday. ? The photo?s release capped a busy day on the spacestation, one that started with computer failures that temporarily cutcommunications between the orbiting lab and Earth.? It was supposed to be a dayoff for the station crew, so Mission Control promised to give the fiveastronauts aboard a free day on Wednesday to make up for it. The space station is currently home to Noguchi, twoAmericans and two Russians. Endeavourlanded safely at NASA?s Kennedy Space Center in Florida Sunday night at10:20 p.m. EST (0320 Monday GMT) to end a 14-day mission to the space station. Noguchi, who represents the Japan Aerospace ExplorationAgency, actually released the first photo of Earth taken through the new Cupolawindows when they were opened for the first time last week. He has lived aboardthe station since December and is in the middle of a six-month mission inspace. Astronauts on the space station are able to post theirown images and Twitter updates thanks to a nifty space Internet connectiondeveloped by NASA. The connection allows station astronauts to surf theInternet by using station laptop computers to control a dedicated desktopcomputer at NASA?s Mission Control room at the Johnson Space Center in Houston.